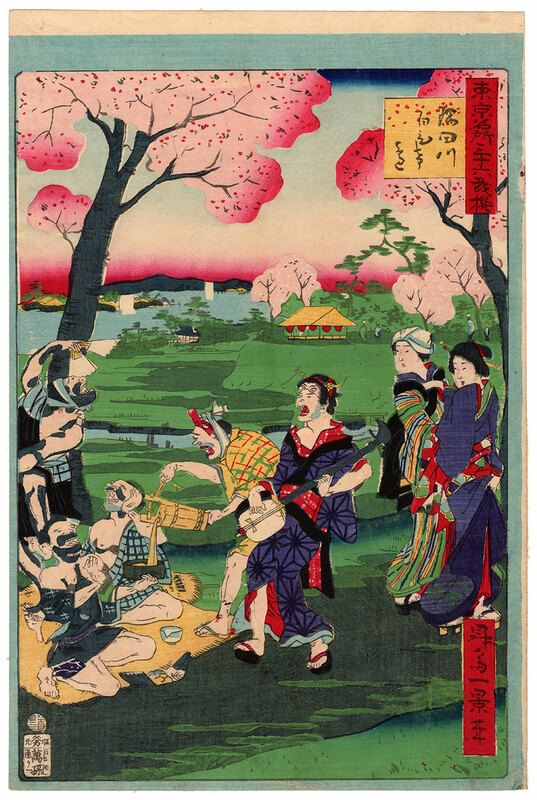 In the beautiful setting of the Shirahige Park (白鬚公園), on the banks of the Sumida river (隅田川), a group of decidedly drunken friends has fun, among the cherry trees in bloom, wearing masks and singing on the notes of a shamisen (三味線) lute. 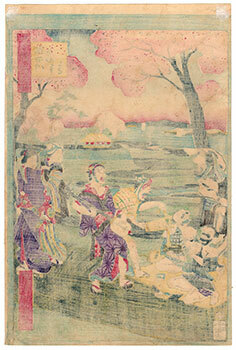 On the right, a young bijin (美人), who walks in the company of another woman, observes the funny scene with amusement. The beautiful large vertical format woodblock print was made by the artist Shosai Ikkei (昇斎一景) and is taken from the series "Selection of Thirty-six Humorous Views of Famous Places in Tokyo" (東京名所三十六戯撰). The work on Japanese washi paper (和紙), printed in 1872 by the publisher Yorozuya Magobei (万屋孫兵衛), is in very good general condition.